Software freedom is a luxury. I often talk here about software freedom, I advocate it, I fight for it, but let me tell you again: software freedom is a luxury, in order to enjoy it there are other things needed, like a democratic society, law, justice or freedom of speech, if there was a Maslow pyramid of freedoms, software freedom would be somewhere to the top, with those basic things as its base. You know, the things you take as granted in a country member of the European Union and for which people died in December 1989. 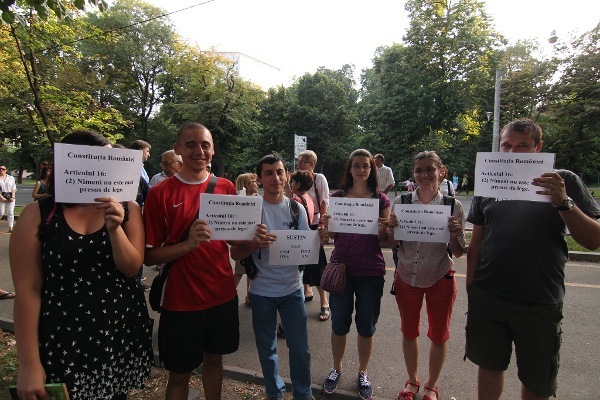 Those things are now at risk in my country, Romania, where in the last few days the democracy imploded. The American embassy expressed concern, the German one did the same, the French government did the same, the EU Justice commissioner did the same, there are talks about suspension from the European council. If it sounds like hell, it is because is hell. 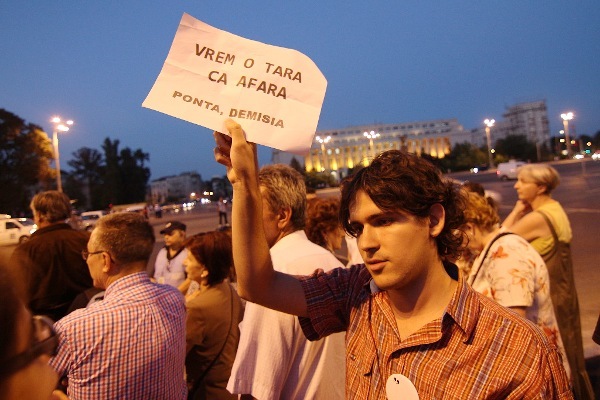 "Prime Minister Ponta, in 2 months you destroyed the democracy built in 20 years"
The problem is, even if the current government isn't, we, in some parts of the country, are a modern European society, we don't have guns to take them in the streets to defend democracy. We have families and jobs to keep, the best we can do is to go out in the streets and protest. 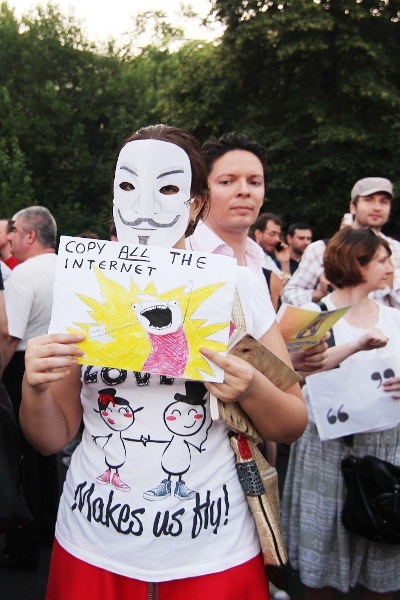 Then document everything online, since the traditional media is owned and controlled (more on that later). The moment was "well" chosen: the country practically melts at near 40°C, students go home for the summer break, parents are worried with their children in the middle of high-school graduation exams, people are planning summer vacancies away from the city - you know, what a normal society is supposed to to. Unfortunately, a corrupt government takes us from normality and make us go out in the streets. Even the computer geeks (especially the computer geeks, who are part of the progressist class of the country). So what happened? Let me get back in time for a few months: the year started with a heavy winter, with even below -22°C and a center-right government based on a weak parliamentary majority being hard on economy trying to keep the country economy stable and avoid repeating the Greek situation. Of course the austerity measures (they were in power since 2008, for all the global crisis) made them unpopular. Add some corruption, which seems to be a constant to all Romanian governments, some mistakes and a very good propaganda machine in the hands of the opposition, they were going for a big loss in the upcoming general elections, scheduled for this autumn. But then something happened: opportunists changed parties, seeking for a warm place and the parliamentary majority changed. The government changed, a coalition formed around the ex-communists got into power. "Why do you lie to us?" So far this is democratic play, it was all legal even if apparently dumb: the former government was unpopular and still losing popularity, more austerity had to come. The communist had nothing to do than just wait half a year and they were approaching a slam dunk, winning election with no effort. Yes, getting into power earlier gave them some advantage (a few years ago their leader, the current Romanian Prime Minister Victor Ponta declared after losing an election "we lost because their vote stealing machine was better than our stealing machine"), but also had disadvantages: in those months, despite their promise to raise salaries and pensions, they would have been forced o keep austerity, otherwise the country economy goes into chaos and they have their hands tied by the European Union and International Monetary Fund anyway. So why hurry? The ex-communist party had the government from 2000 to 2004, when they lost election facing a wave of people angered by their corruption and anti-democratic actions, like free press suppression or using the justice to destroy political enemies. Then came as a hero the current president Traian Basescu, which they tried to impeach back in 2007 but failed, he was re-confirmed with a huge majority and was re-elected in 2009. The main promise of president Basescu was freedom of justice and this started to bring its fruits, after many years of delays the courts approached verdicts in some major cases, one of them being Adrian Nastase, former Prime Minister. They HAD TO stop justice. As icing on the cake, the current PM, Victor Ponta was revealed by the British magazine Nature as a plagiator in his PhD thesis, situation in which other politicians of the world had to resign their seats. That HAD TO be stopped too. 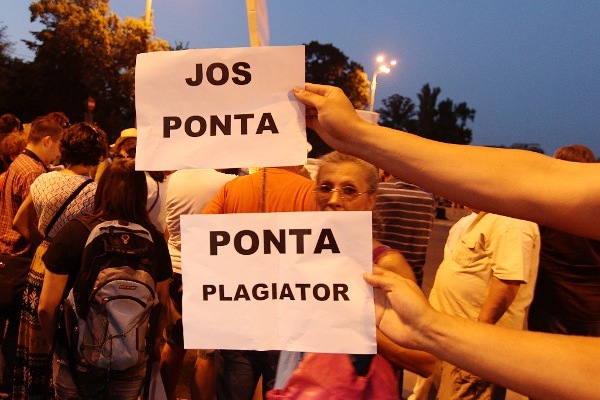 "Down with Ponta" and "Ponta is a plagiator"
The hard moves started last week, when the public television management was changed to be comprised only of government representatives (traditionally, it also had proportional representatives from all the parliamentary groups). In rural Romania internet access is limited, people get most of the information from television, so they assured to take control of the public television. They also had control of the biggest private media trust in the country, which is owned by Dan Voiculescu, a known collaborator of the secret police from the communist dictature and they have control over other smaller media companies. 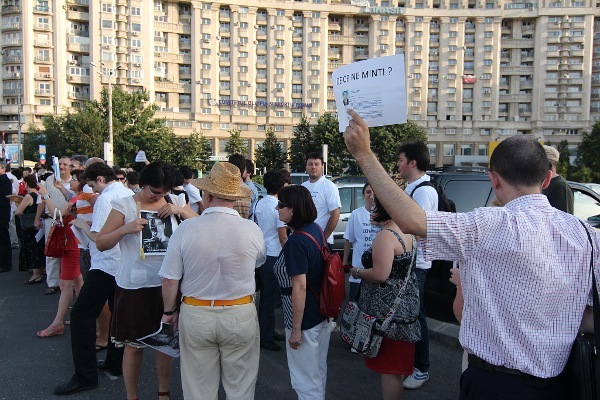 A second move was to move Monitorul Official, the paper where the laws are published before they are able to function, from the Parliament in the direct control of the Government, this way it can be used to their own purposes - the first use was to escape the above-mentioned media-mogul from an imminent judicial sentence. The second use was to dissolve the universitary ethical commission who would have recommended retiring the Prime Minister's PhD. "We want a country like outside. Down with Ponta"
This week the things accelerated. First, the People's Advocate was replaced: over the summer the Parliament goes to a break, the government will pass "urgency orders" which are to be approved as laws after the parliamentary break in the autumn, but until then they have the power of laws and the People's Advocate is the only authority able to challenge them in the meantime at the Constitutional Court. Then the presidents of the both parliament chambers were changed, with government representatives - this is again against the law, since they were supposed to be replaced only with another members of their party. Then the government passed an urgency order which limits the Constitutional Court to oppose the impeachment of the president. Yesterday the impeachment procedures were started and tomorrow a law (or urgency order?) will be passed to simplify the procedures of dismissing an impeached president. 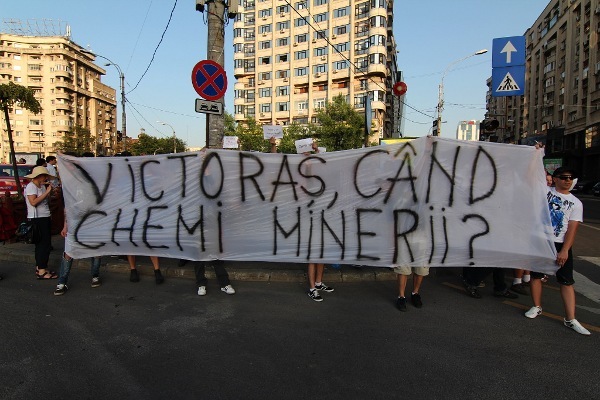 "Victor, when you will call the miners?" What's next? The president will be impeached, a referendum will follow in about 3 months. In the meantime, his place will be held by one of the government coalition leaders, which got into this position (Senate President) just a couple of days before, he will have almost all President powers, including to pardon and put into liberty condemned criminals (hint, hint!). The last standing democratic institution is the Justice, which have leadership changed scheduled in September anyway, with the new leadership to be put in function by the government, parliament and the (temporary by then) president. And then this government will "organize" the presidential referendum and new parliament elections. In a country which will be no more a democracy. "Hello political parties. 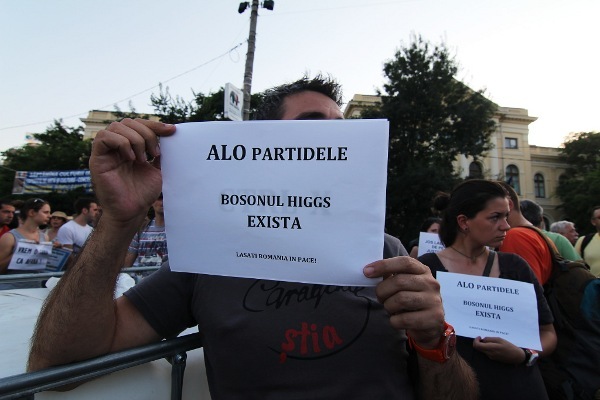 The Higgs Boson exists. Let Romania alone." Excelent! Thank you for this! 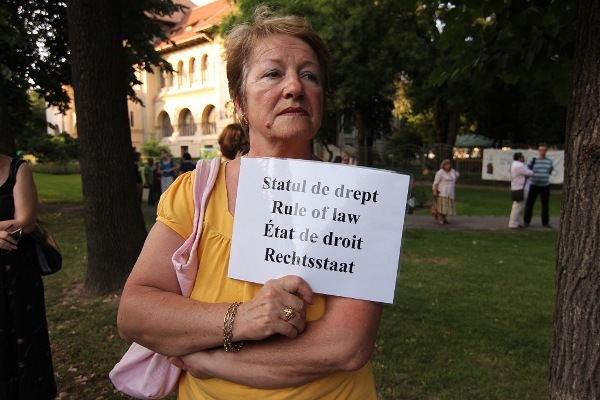 The presidents of the Parliament chambers were changed illegally, but that's because in Romania they can only be changed if the political party that proposed them initially changes its mind. This curious decision dates from 2005 when both chambers of the Parliament were led by former communists although the majority was against them. Also, it only takes 30 days to organize a referendum when the President is impeached. But there are rumors that the current f**ked up government wants to change the referendum law by passing an emergency resolution. And they will probably also shorten this period to less than 30 days. My 2 cent's: President Basescu should be impeached, a lot of our fellow countryman want this, they are tired of president's Basescu "supreme leader" (wannabe dictator, have all power in the country) attitude and the criminal and interest groups around him. You could write a wiki with reasons why Basescu should be impeached and why he dosen't deserve to be president. Ponta maybe isn't doing things 100% the right way, but I, at least have had enough of Basescu. 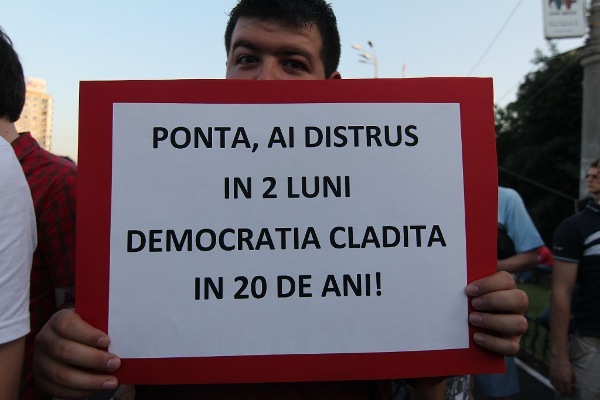 And if Ponta or Crin will do anything wrong I'll speak out against them too, but for the time beeing Basescu IS the biggest danger to our democracy. When USL change the Senate president they also ousted Roberta Anastatse, the one with problems at math (counting votes), http://www.youtube.com/watch?v=Du3jQ74GdSw . The president didn't do anything about someone from his favourite party who stealed votes live to pass a law. Especially when throwing accusations without facts. Why don't you write that wiki and post it here so we can all be enlightened ? 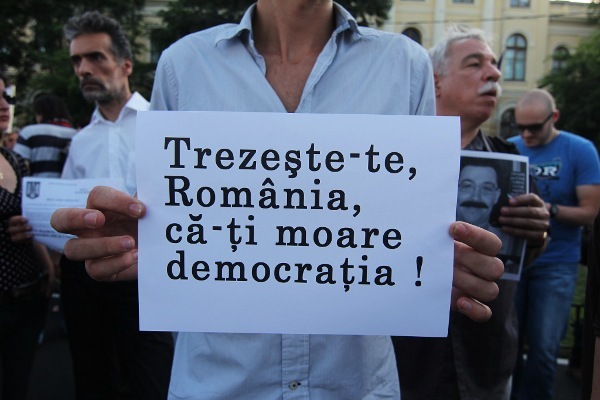 And since in your opinion Basescu is the biggest danger to our democracy let's overthrow him using _more_ undemocratic measures ? At least your president doesn't have a 2/3 majority to rewrite the constitution, voting system, and in general any law to their own benefit, didn't declare einstand on your private pension fund, and so on..
brb, TEK's knocking on the door, NAV is here to audit our tax records, and every blood relative three generations across has just been fired from any government jobs they may have had past and present and must retroactively refund their earnings for the past ten years. I lived 16 years in a communist dictatorship, so i know how that is. But from a country member in the European Union, you expect a certain level of democracy and freedom.